Where You Can See My Work This YearBack to BlogSo excited: One of the 28 artists chosen for the Portland Museum of Art Biennal! Appleton artist Abbie Read has been invited to participate in an exhibition featuring Maine artists to be installed in the U.S. ambassador’s residence in Doha, Qatar as part of the State Department’s Art in Embassies Program. A curator for the Art in Embassies program chose a scaled down version of Read’s recent installation titled Library which is made up of hand crafted artist books, altered books, old books and found objects. While the entire piece is now 36 feet long, a 10 foot portion of the “wall” will travel and remain in Qatar for two and a half years. As part of the AIE Artist Exchange Program Read will travel to Qatar to install the piece this fall as well as participate in local cultural programming meant to further cultural diplomacy through the visual arts. Other Maine artists to be included in the exhibition are Anne Neely, Shannon Rankin, Jeffery Becton, Claire Seidl, Grace DeGennaro, Gabriella d’Italia and Alex Katz. 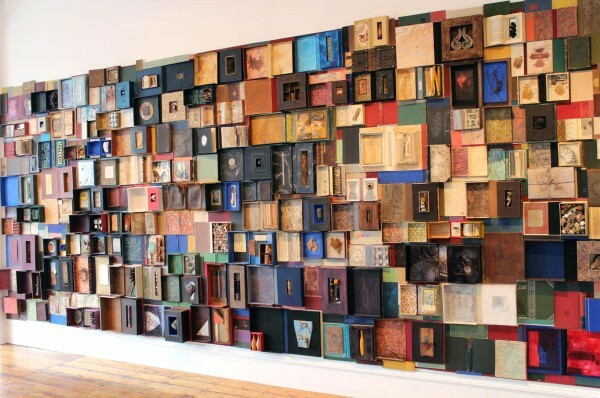 Library is a three dimensional mixed media construction which is wall mounted and was first exhibited at Aarhus Gallery in Belfast, ME in 2012. Since then it has been exhibited, slightly reconfigured, in Rockland, ME and at Unity College in Unity, ME; in the fall of 2013 it was included in the Portland Museum of Art Biennial Piece Work. Most recently it was installed in its entirety at Waterfall Arts in Belfast. Library is intended to engage the audience in thinking about the nature of books as physical objects and their role in research, narrative and the sharing of stories, our own and those of a universal nature. To see more of Read’s work visit her website at www.abbiereadartist.com. As an undergraduate, Read studied printmaking and art history at Oberlin College, graduating in 1978. Following seven years teaching art at Concord Academy, in Concord, MA, she and her husband relocated to Ann Arbor, MI where she attended the School of Art at the University of Michigan, receiving her MFA in 1991. Abbie and her husband Bart moved permanently to Appleton, Maine in 1998, where she works daily in her studio on Appleton Ridge.